It’s ridiculous that I have to pay 50% of the face value of the ticket in fees. I do not like the extra fees. They anger me. The service fee per ticket is ridiculously high! I wish there were an alternative to TM. Had great McCartney seats until the order button didn’t work. Thanks the immediate resell. Geez. No obvious option to have tickets emailed. Gr8 App. Can always count on Ticketmaster! The UX is awful. It is very difficult to look at a number of sections and see all of the tickets offered. Would be better if I could Apple Pay with the phone I am purchasing on. Wish I could use my gift card on fan to fan resale. What a joke of a website! People, do not waste your time going to Ticketmaster.com to purchase tickets for any event PERIOD!!!! Does not work properly. Waste of time. Custer service was useless. Not impressed with availability when just releases tickets available to purchase ! Good, simple, easy service! Maybe a little pricey! This was a very effective way to attain a great seat. I was allowed to buy front row seat tickets from a reseller through the Ticketmaster app for a much higher price. However, when I received my tickets they were general admission only. When I called saying that there must be some mistake they apparently couldn’t care less. Escalated to manager....couldn’t care less either. Ticketmaster is dead to me. Stubhub I’m sure will take my business. The extra charges that they charge are outrageous. I hate them. Very frustrated that the Map was not available when purchasing , I tried chrome browser on the computer as well as my phone and my app... all just keep loading and never actually show the map of the arena, I had to Google it on a different website! The commission is so high. $10.89 fee is for a ticket $66. Thank you. Can’t talk to an agent. Had to purchase single Tix! NO FANCLUB PRE-SALE & Had to purchase 2 single Tix again!!! Another TM fiasco! I have purchased tickets twice recently to very popular events. It would be so much easier to be able to seats that are available rather than randomly trying dates until I got lucky. Each time I spent about an hour trying to get tickets. Timed out while completing my order - lost better seats! I accepted the seats as soon as they came up but Ticketmaster took so long processing my payment that my time to purchase time ran out & I lost better seats! Happens every $&@% time!! So frustrating!! Website works fine, but fees too much! About 20% on $400 of tickets is an “inconvenience” charge!! 1) If discount code is entered after ticket selection, the discount does not get applied 2) When the above is discovered at checkout time, ticket cancellation works, but ticket release does not. The same seats does not show up as selectable. (The same seats were desired but with the discount code applied) 3)Either a Long wait or selection from a different event has to happen before the released ticket shows up again. And waiting too long led to those tickets being bought by someone else. I don’t like the fact that I can’t print a ticket. These tickets are a gift for my husband and I wanted to put them in a Birthday card. First ticket purchased didn’t get through. VERY DISAPPOINTED!!!! What r u doing to justify these fees? The app is so slow and has limited functions for selecting particular sections. Much better to use their website. Their new waiting room thing is ridiculously stupid and gives scalpers more of a chance to snag tickets. And their platinum seats are a complete scam, I mean if you’re gonna scam your customers at least make it less obvious lol. Should really fix your issues before something bad happens that’s for sure :/ a shame to watch this service go downhill. I don’t recommend buying from them again to be honest, save your money. Ticketmaster makes the world go round! Every time I get the tickets I want. VIP etc. The sky is the limit! Ticketmaster rocks! The app is easy to use. Easy to navigate. It’s hard when the fees for three tickets almost add up to the price of one ticket. You can’t keep gouging the fans. Stop frustrating customers by listing add-one that are sold out. The convenience fees are a little pricey. Ended up calling my bank because I thought my credit card had been compromised. Turns out you could only purchase the seats with a specific credit card I didn’t have, but that information was in a fine print and the error message sent me on a wild goose chase. I would purchase tickets via any other service if available. Ticketmaster is the worst. All the extra fees are ridiculous. I can’t believe I paid almost $70 in extra charges. Fees are getting out of hand on these types of sites!!! We may avoid using in the future. This is a easy site to get through. Got my tickets in less than 5 minutes. Using the facility map provided, the online purchase process is quick, clear and precise. So slow, so confusing. Can not reach Ticketmaster for help. Yuck! Ticket prices are a lie. Shame when $22 tickets are actually $38 tickets. Just be honest, real, upfront about ticket costs. Your service fees are preposterous and despicable. I hope the government will regulate your DISservice to the public. We can’t enjoy going to many concerts because of your high fees!! Does anyone think that there is any grounds for a class action lawsuit against this awful company? I’m trying to buy tickets and was kicked out 4 times and nice it says I ordered over the allowed limit so have no clue if I have any tickets purchased! I have a code for 20% off, “INSIDER”. Nowhere to put the code. So I didn’t get my discount!! I don’t understand how the service fee can fluctuate from the computer I’m staring at to my mobile phone. The service fee for the exact same tickets were $5 cheaper on the computer than on my phone. Add on another 10-15$ a ticket...??? They used to be really reputable; however I just bought some tickets for $500 and just In case of an emergency bought ticket insurance. Well we had an incident and turns out we cannot go to the event. I try and sell them back and the option is not available due to the ticket insurance and ticket masters policies!! $500 down the drain!! It took me 4 attempts to get tickets to the Atlanta United match on 6 October. Frustrating! It is now 1hr and 20 min since a sale started. Nothing could be found for at least the first half hour. When seats finally are found, if I try for others, it just keeps offering up the same ones. I miss the good old days. I had tickets secured on my screen numerous times for the Harry Connick Jr. Presale in St. Louis. The system kept kicking me out when I clicked “continue”. Super frustrating. Kept kicking me out and now I’m 8 row up farther than original ones! Still not nearly as easy to use as StubHub. And Stubhub isn’t so great either. I’ve been buying and selling baseball and football season Tix in both sites for years. Just fair on both. And the 20% they make in each sale for a mediocre site is highway robbery. I tried to buy tickets for a popular presale of a show, and the site wouldn’t show any tickets available. After using the presale code and logging in 7 times I finally got some tickets. Ticket $18 and service fee $8.50. Come on Baltimore Soundstage, pick another ticket provider. This is outrageous. I’ll be looking for other venues. 2 tickets...$80 each. Total price $186. What?!?! It’s very difficult to share purchased tickets - even as they create accounts or download the app. We tried multiple times for two different parties, and both encountered the same error. It was impossible to share tickets. Disaster of an app. Getting tickets on the fly. I shopped around and stubhub which is where my event was at wanted $44 additional per purchase. Ridiculous. Don’t like that we are unable to pick our seats. When using the App, seats at generated for you. Also max ticket purchase is 4, making it difficult to buy for a larger family group. Thanks for making it impossible for old people to use your app and ticketing system or even to receive tickets from family and friends. Every time I try to look at tickets the app freezes and displays a white screen. This makes it impossible for me to select my desired seats. So every time I want to use the app after midnight it doesn’t work. It stops working from 12am-5am. Most of the time I do my ticket buying around that time when I get paid. It never works. I hate Ticketmaster. Fees are outrageous and mobile only requirement for many events is ridiculous. Doesn’t waste your bandwidth this is garbage. My iPad is updated with the 12.0 version. The Ticketmaster app opens with a blue background and then closes. Fix the app so it doesn’t crash. Very frustrating when trying to purchase tickets. Always a quick well executed experience on TM. Wouldn’t let us get closer tickets because we left one seat open when there were clearly one seaters scattered in rows closer than we were looking. Hypocrites. The fees are almost one ticket. That’s obscene.? I don’t appreciate when I’m trying desperately to get all the information in, your little clock never pauses. I got it all done, it was loading the order, and it came back with, too bad, it timed out. Lost the seats. For a friggin’ I-AA game? Rip off!!! As easy as any app I have used and seat map purchase option made it super easy. Will use again. Thanks for the opportunity to buy tixs in various locations during her visit to Oracle Arena next January 2019. I had to try 15 times to purchase tickets for an event. I kept getting an error, oops our bad, start over. Then I called to purchase and there was incredibly high call volume, but you couldn’t wait to talk to someone. Website states they are open until 6pm, it is noon now. Please, could you charge more in service fees?!? It’s not near enough. I liked getting ripped off. Thank you. Love him! So happy he’s performing at MSG ! Although their online ticket purchases are much much easier these days, they are still expensive and nearly a monopoly. Not good for the consumer. I had a hard time using this app. I had previously chosen and finished the checkout for tickets that were only $25.. the app crashed on me multiple times, so I had to wait a day to buy tickets. I went back on and the tickets I wanted were gone and I had to spend extra money on tickets. Citi card preferred link results in spinning circle, “Loading results”, and nothing more. I have a Citi card, want to use it, but can’t. Add to that almost 30% in fees, and I’m not happy with TM/LN. Took hours and multiple attempts to get tickets VERY frustrating. I thought Apple bans apps that scam people. What’s up Apple? Enjoying your share of stolen money too much to pull this perpetually criminal activity from your store? Why is there no option to choose you own seats? There used to be. Is that just not allowed on the app? Not only have fees increased year after year, now they’ve been caught working with major scalpers. Not against them as they have claimed. I want every single person who works for this company to die a horrible death, many times over. Great idea, but it doesn’t work. The app is useful about half of the time. I’ve learned the hard way that I either need to download my tickets to a .pdf reader app and save them on my phone/iCloud, carry a laptop with me or print my tickets on paper, because if I rely solely on the app to get me into an event that I’ve paid good money for and don’t have a back-up plan, I will have a hell of a time getting into that event because the tickets don’t always show up in “My Events” and there isn’t another option to view my orders within the app. Even on the website, I have to click on “My Orders” to view my tickets for upcoming shows/events. Otherwise, it just shows me a notice saying, “You haven’t purchased tickets for any upcoming events.” 🤯🤯🤯😤😤😤 Please fix this! Dealing with Ticketmaster is almost always a headache anyway. Might as well make something about it easier for customers to navigate, right? The app works better than it used to but the fees are still ridiculous! $96.00 ticket plus $23.00 in fees... ridiculous! Ticketmaster is a scam company that links with scalpers in order to upsell tickets up to 3.5x their actual value. The only way to stop this is to stop their use. Please find another way to get your tickets! Never displays tickets I purchased on other devices, text constantly overlays other text. Huge waste of time, 0/10. Over priced and to long a process to complete. Extremely to high. Very easy and quick to use!! You betray our trust, you lose our business and a good review. Tickets just released. Priced at $185 and then an additional $60 charge per ticket plus processing fees??!! For what? Frustrating that it would show tickets available but then say they weren’t. These tickets were not in high demand so it was not a timing issue. Had to keep searching till I found some. Everytime I had any issue with my tickets that I’ve bought or sold someone in the live chat helped me efficiently and effectively. The fees are a little lower than Stubhub. I have avoided buying from any other website because I know that they care about their business by the way they handle their customer’ service. I’d rather take an ice pick and stab my kidneys over and over than ever order from TicketMaster ever again. I could regale you with my story of lost money, lost tickets, charged credit cards, and the worst customer service over ever experienced in my life. And I have DirectTV!!! So that’s saying something!!! Instead I’ll just say this: if there is ANY way you can get tickets outside of this pile of crap company, do it. Even if it’s more expensive. Do it. Even if you have to drive 4 hours to get them, drive there and get them. That, is how much I’d avoid this company. If TM had a cure for cancer (because TM is cancer), I’d be ok with dying a slow painful death before ever giving this company another penny of my money. Trash, lies, and scams. You don’t pay what they say... much much more. Highway robbery by a monopoly. How is this legal? Constantly crashes or closes you out of the event you are reviewing. Horrible. Frustrating. Fees are outrageous! Tried to buy a verified reseller and fees are over 20 percent. So I can use my phone as a ticket! That cost $100 ???? Get rid of the automatic recording system. Get real people to assist. The system is not understanding people’s voices correctly. It irks me that I did not have the option to choose paper tickets. I’ve collected paper tickets for all of my concert-going life. I’m 55 and have collected a lot over the years, since high school. Ugh! Disappointing. Even though I hate paying so much in fees, I’m confident that the tickets I purchase are not fake. First I could not change my email, then I was told there was nothing they could do. Then they said everything was fine. Got email they cancelled my purchase. Then could not buy the tickets with generic error. Could not add credit card to my account. Every time I tried to buy the tickets in 15 mins, I got 3 different prices for the same tickets! What a scam! It may be time to get congress involved in an antitrust investigation. This is ridiculous. Fastest & Easiest purchase of tix EVER w/this App!! Easy to purchase tickets on your smartphone. Fast tickets !! Same day game !! Even hours before . I live in Utah and frequently go to Las Vegas, Nevada and Salt Lake City, Utah for concerts. Recently I have been to Korn in Las Vegas on September 15th and there was no problem. I got the tickets I wanted, got in nice, and even though there were fees, I was willing to pay and I was understanding. I have bought more tickets from ticket master with no problem for future events. Everything went well for me. Super fast and easy to get the tickets I want. Love picking my own seat. Just got Jay Z and Beyonce tickets! Seamless process. I love Ticketmaster!!! ticketmaster is ripping people off. i had to pay a fee to purchase NFL tickets. i know as a season ticket holder, when i put my tickets for sale i also pay a fee. seems like double dipping and bad business!! there should not be a fee for the seller and the purchaser. SMH. I love Ticketmaster, it’s very convenient! Choosing your seats is harder on ticketmaster compared to stubhub. It’s easier when you give customers the option to click on a section of their choosing to find seats, rather than selecting from a drop down menu. The fee are more than they should and you can’t have the ticket on your phone so now you have to find a computer and a printer. What are the fee for? It can be impossible to really know where your seats are. Not all seating charts enlarge or show seat rows and numbers. At some venues where entire seating is flat, this is not noted. I use this app at least monthly. It’s easy, fast, and accurate! My only place for tickets. Fastest, easiest ticket purchase ever!! The fees are ridiculous. I could see if agents were assisting me but they are not. App is easy to use and good prices! I got money together to get Garth Brooks tickets and waited 4 hours to order. The app wanted to update in the middle of me trying to order and I couldn’t order because of it. So this wax my birthday gift to my boyfriend from he’s mom, grandma, aunt, cousin, me and my daughter. Ticket master screwed me other on it. I wouldn’t use them ever again. I spend a week getting money and plaining this for him. DONT USE THIS APP OR TICKETMASTER!!!! I’m giving this a 1 star for the time being, because it seems that for some reason whenever I tap “add to Apple wallet”, nothing happens. I’ve went through the settings to see if maybe I changed something, but nothing was unusual. I would like to see this issue fixed or at least get some troubleshooting help with this issue. Thank you kindly. Didn’t get the seats i wanted because system clocked for 30 minutes and I had to go back and deselect. Lousy app signed me out when I entered queue for tickets. Lost tickets I picked. Had to sign back in and pick tickets 14 rows higher. Easy to use but would be better if you were allowed to add to your order (parking ) before completing the purchase. Now you have to make 2 different purchases. I bought tickets way in advance for a show because i knew it would sell out. As I got closer to the date, I realized I couldn’t attend. It was sold out, so I figured the tickets would sell. I was willing to take a hit on the tickets to unload them. Ticketmaster put an artificial floor on the ticket price. So, all resale tickets started at the same price. Mine didn’t sell because I couldn’t lower the price. You will over pay with these scammers. Went to buy tickets for a popular concert (so the tickets were selling fast). Got on an hour in advance to be in the waiting room to get the seats I wanted. Waited in that waiting room then was randomly placed in line (about 100 something) then when I went to buy the tickets the app redirected me to the online sight where not only did it lose the tickets I had originally went to purchase, but replaced me at THE END of the line with 2000+ people ahead of me. I will NEVER depend on this app to get me tickets again. Absolutely garbage and a huge disappointment. Ticketmaster is a hideous, bloodsucking monopoly that extorts artists and fans alike and deserves to be obliterated by every antitrust law on the books. The app works. Crooks. I couldn’t use my class action vouchers for the sale. Unacceptable. It would be nice if TM didn’t make it so hard to use the vouchers given to customers when they lost the lawsuit. It took over 30 minuets to finally get my ticket order accepted. At one point, they requested that I sign in with FB account which I refuse to do. The whole purchasing attempt was extremely frustrating. Easy to navigate, Takes hardly a few minutes. Easy peasy quite simple and fast Now let’s go have some Fun!!! Awesome way to shop for tickets at market value prices. No way to get voucher discount on app and said I had to use app on my desktop. It was very difficult to pick the seats I wanted. All I wanted to do was look at a nap and tap on the seats I wanted. It would not let me do that. I didn’t 45 minutes trying to get my seats. I’ve had issues at times with the app “getting stuck” I guess you’d say. Says it’s securing tickets and just keeps spinning forever. Also wish there were value indicators like Stubhub and SeatGeek have since done tickets are resale. Every 30 seconds I got a notification that my location had changed, it took me 3 times longer than necessary to order tickets. Hitting “no” once should have been more than sufficient. Absolutely frustrating! I hate how you can’t buy a single ticket. Love how user friendly Ticketmaster is! Ridiculous fees and service charges. The price was $89 and I did the confirmation, the. You TM put me in hold and then the ticket cost me $100 each... I know is only $22 but the action is bad. Fast and easy to get tickets needed. This is not really very well designed to purchase tickets to events. 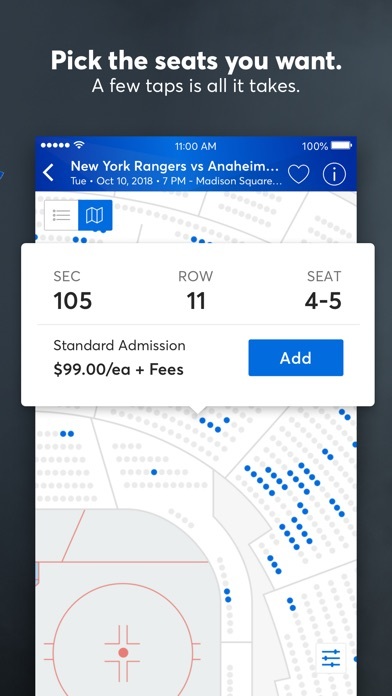 It’s difficult to visualize your seat locations, it frequently locks up during purchases, it frequently produces cryptic error messages, and of course there are the hidden fees added to all tickets, which are very difficult to determine until you get into the checkout flow. The AXS app Is a better experience, but of course it has access to different events. Ticketmaster was quick fast and in a hurry !!! Thanks Ticketmaster !!! Fees are too high and they operate a secondary market that horribly overpriced. Fees are too high and they operate a secondary market that horribly overpriced. I would give them Zero Stars if I could. There’s no doubt in my mind that they give preference to scalpers. Went to purchase two $25 tickets. Now I know what you’re thinking. Two x $25 = $50. Wrong. You clearly didn’t pay attention in math class. Two x $25 = $75.50! Who doesn’t love a $10.50 order processing fee per ticket? Not to mention the $6 service fee, because the automated system has a family to feed. And yet, when Ticketmaster is the only way to buy a show’s tickets, what option do I have? Ticketmaster is a joke and is anticompetitive. I REALLY don’t want to use them but in most cases, forced to. The site was slow and I had to restart once, but it’s Ticketmaster so I’m happy with the security of the site. Hello, I got on to buy tickets at 10AM, didn’t get through until 11:45AM and got nosebleed seats. I’ll take the tickets I get since I’m happy to be there, but it shouldn’t have taken so long. Any further explanation could be great but if not thanks for the tickets. Seriously slow; not intuitive...miserable graphics. Just a poor effort allow around. Every time I purchase tickets on Ticketmaster, it’s an easy process. They have my payment information already saved! Keep up the good work! I tried 3 times on my laptop and my son-in-law tried several times as well from a different laptop. Neither of us were ever given to opportunity to enter payment information. Should not take one person over an hour to order these tickets. Had to download Ticketmaster app on my IPad in order to purchase these tickets. Makes no sense! So, if I did not own an IPad, I guess I would not have been able to purchase tickets today. $20 tickets x4, w/ $10 fee per ticket, plus $6 service fee, plus about 3 other fees- Ridiculous!! Planning to get tickets for a surprise gift, the website will not work, citing software/hardware conflicts. I installed the iPhone app before reading reviews, never again. There appears to be too much risk of exorbitant fees and even purchasing resell tickets. It looks like boys get tickets immediately and can resell through Ticketmaster. Because that is wrong on so many facets, I shall go back to avoiding anything to do with Ticketmaster. I’ll try other venues or just disappoint people about tickets. Money is better spent on worthwhile ventures. I’ll never give you guys 5 stars because you stay scamming people with that service fee. Easy to use. Nice way to look at the seats your buying. Gift card doesn’t work for mlb games. How about a heads up up front? Ticket master app froze and ticketmaster scam fees went from $10.20 per ticket to $11.20. Logged on right as tix went on sale. Tried 4-5 times to get tix. Kept getting error message to call TM there’s a problem with my order. Finally got through an hour later and the tix are far worse than what I could have gotten at open. thanks a lot TM! Not really. I just purchased several tickets for an upcoming event and the process was smooth and seamless. I like everything about it but, $55 in fees for each ticket. The app just wasn’t working..
Several times the app said I couldn’t use my device, then the seats I had selected were not available on my other device until later. Payment was not able to add my coupon code. I want to purchase my tickets in my computer and be able to print them from my computer. I kept getting a message that said print at home was not available. At one point it said it was because of the devise I was on. I tried 3 Devices and finally tried splitting my order with tickets and parking in separate transactions and it worked. Madenning! Love this app - in and out in less than 2 minutes. No digital download to iPhone? Really / only option is pick up at will call. What crap is that in today’s technological age? Couldn’t buy a ticket on the desktop website. Sucked. Had to use mobile app. Very fast and easy to use!!!! Easy to navigate, smooth transactions. I have never had any issues with TicketMaster, I’ve been using it for years now. Just bought some tickets for Warped Tampa the day of, of course the transaction took less than 5 minutes!! Thank you Ticketmaster :)!!! This app and the website won’t even process my order and let me get tickets. Done with Ticketmaster. More like Dicketmaster. The app is great but the fees Ticketmaster charges are outrageous. They cost nearly as much as the ticket itself. I love how convenient and fast loads up gets you where you want to be. When the prices should be lower since the event is coming. Please add 3D virtual seat view. This is the worst site to buy tickets. I tried to buy two tickets at the end of a row where three were available and it told me I could not buy them. Then when I selected two from a different row it told me I could not use my desktop to buy the tickets. For as much money as they rake foe each ticket you’d think they could use better trained monkeys to design the web page. Fees are outrageous and the offers are sleazy. The app works fine. But Ticketmaster fees are outrageous and it’s sleazy and insulting to then also have to receive all these sketchy offers at the end of every transaction. The ticket master markup is ridiculous! So the ticket price is 40, but you are out of those, yet on the same exact page there are “resale” tickets for 150. Something smells fishy. Need to be able to talk to a “live” human being so deferent section priced tickets can be explained. Took too much tome to enter and read adds asking for more money. I lost my first choice of tickets because of this. I would have thought since I had previously registered with Ticketmaster, it would have retained and automatically entered my demographics. My boyfriend is very particular about sitting in a certain spot, and I couldn’t choose our seats the last couple times I bought tickets. Needs better seating charts with views. The industry standard for gouging the consumer with at least 25% the cost of a ticket for service fees. The app says there is a required update but when I try to update the app, it says just to open it rather than update it. I can't use the app because I can't update it. Catch 22. Super easy transactions and efficient place to store digital tickets! Love it!! Not user friendly. Hard to navigate. No cart? Phone lines are always busy and auto buy never works! I think the protect your ticket thing is unfair. If a concert’s canceled, the customer should always automatically be refunded without question. I kept getting message to use a different device. I used THREE different. These are two hours I’ll never get back. If not for the high fees, Ticketmaster is all right. Why can’t you share a ticket direct from the iPhone wallet anymore??? In order to share a ticket with my kids they need to create their own Ticketmaster account? WTH? You used to be able to do this and it worked great!!! Bring it back!!! ($5 “service fee” x $7 ticket for a pre-season Bengals game at Paul Brown) x 2 tickets = the epitome of corporate greed and profit margins far too large to fill any man’s pocket. This logic is ludacris in my very humble opinion... but I digress. Where does it end?? Interactive seat map helps you choose the best seat that fits your location preference and budget. I was connected to WiFi and after I selected my shipping method the app took too long to confirm and I was timed out and lost my tickets. When I went back in to try again those seats were gone. Also mailing tickets shouldn’t cost extra money. I like the app because now I can see what’s coming in the future. Got tickets but wish I could see all the options.... I may have paid more if I wasn’t so worried I wasn’t going to get something decent. What happened to on line? This app is awesome & user friendly! Thx, V. Seay McDonough, Ga. The app still charges overpriced fees for an electronic arbitrage process - you’re always screwing consumers with excessive fees - Ticketmaster Corp is a monopolist company. Fees are way too high - this is ridiculous- didn’t they go through a lawsuit because of this ? ( I still haven’t been able to use any of the vouchers for the settlement ) anyway It’s seems they’re back at it again - $20 fee on a ticket IS WAY too high - and it’s a monopoly-. Taxes and fees are ridiculous!!! Paid $45 in fees. Unbelievable. Will never use Ticketmaster again unless I’m forced too. Easy to use, and very happy with web site, awesome..
App is very glitchy, rarely works, declines purchases (flags fraud) and crashes. Ive had successful purchases with same pricing from my safari. So ticketmaster sent me an email for wwe presale tickets in philadelphia with a link. So i hit the link and purchased tickets, turns out the link was for providence, rhode island. So i called ticketmaster to get a refund since the link they sent me was flat out false advertising since the email said Philadelphia event. So i called to get a refund for these tickets and basically there is nothing they can do. So long story short ticketmaster tricked me into buying tickets to an event i cant attend and refused to give me a refund. Very unhappy with this service and very unprofessional customer service. Will never use this ticket seller again. Purchased tickets to US Open. Seats 1-8 available. Tried to secure seats 1-2. Gave me 7-8. Smack in the middle. Contacted TM 2minutes after purchase. Told me since “Fan to Fan” all sales final. I could only resell. Yet, seats 1-2 are still available. And, no way to specify exact seats. Just automatically get the worst. Thanks TM for all your help. App deleted. Ticket Master comes through in the clutch. No rabbit out of the hat trick, just pure consistent service for decades, helping me to see my both my favorite artists and helping me find the shows I didn’t know I needed to go to. Always on time with the rock and roll and the hippity hop and whatever else gets my body moving and my throat horse by the end of the night. Thanks compadres. 20% over ticket price for fees. The system works well except that it consistently shows tickets as being available but are actually sold out. Frustrating. The additional fees are outrageous. You should be ashamed......just my opinion. You asked. Why are fees so expensive & what service is provided??? Tickets cost $100 Total expenses $143 Long live capitalism!!! You must have American Express to buy certain seats such as the general admission floor seats! That is bs! App makes it so easy! 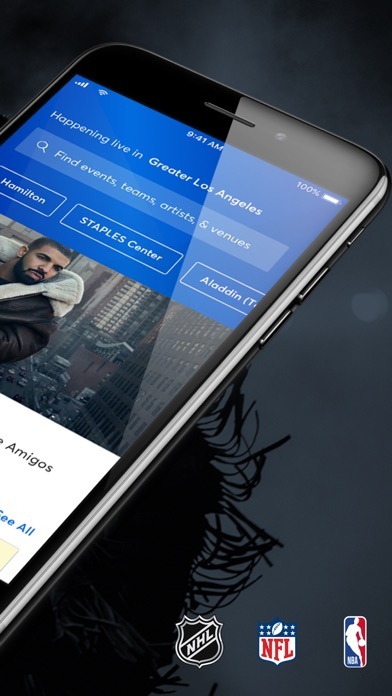 This app makes it easier to get to the concerts we love. Don’t like the fees but appreciate the ease. After being bounced to 3 different phone numbers, I finally reached a representative to add on a 3rd ticket to my order. Only to be told there wasn’t a seat next to us and an exchange wasn’t available. I wasn’t trying to get cheaper tickets I was only trying to make it so my daughter could go to. Now to hope that the 1st set of tickets resell because that’s all I could do. Updated my credit card exp date and after it kicked me out of buying tickets twice and of course these tickets were gone by the time I had to completely get back into your app. Also the only way to buy tickets were to shave the app search for me instead of picking my seats from the map. If I had a choice I’d never use Ticketmaster again and I will buy from another site. For some reason I kept timing out and losing my seats! Very frustrating to use this app. Yes! Going to see the best band ever! As a return customer, I found the new app so easy to use. Looking forward to a great series at Comerica theaters. This was an awesome app and a great experience I would use this app again! Never using this again. It’s a scam. Very easy to find date and seats available. Good discount. Quickly purchased. The app wants you to search for tickets (so you’ll spend money), but it refuses to return any results and throws an error. You can’t get past the search screen to review your orders/tickets. This is by far the least user-friendly app I’ve ever seen. Not surprising, coming from the stellar Ticketmaster engineering department. Just spent $22,324 on tickets and they don’t come with a transfer option. Seems like a platform entirely based on the concept of transferring tickets would allow you to transfer the tickets to the other people using them. signed in with iPad app, it didn’t have any favorite artists, teams, venues etc. from my online account. Android app doesn’t have this issue. Love the app. Makes getting my Atlanta United tickets a breeze. The app is fine if all you are trying to do is look up events at a venue but that’s it. I tried to buy verified fan tickets through the app only for it not to work. When I contacted customer service about it I was told to never use the app for buying (high demand) tickets. It’s a pointless app since you can’t BUY tickets on it. Also it’d be nice if Ticketmaster made it very clear that you can’t use the app to buy tickets. There is no justifiable reason to charge me $14 for the purchase of a $50 ticket. Burn in hell, Ticketmaster. Kids should be free at the event I’ve purchased for but the actual process through ticket master was normal and easy process but the cost is too much. What happened to sharing passes through Apple wallet? Why can I no longer share a pass through Apple wallet? I don’t like being limited to sharing through the Ticketmaster app itself. It’s confusing to the person who receives the notification. It asks them to sign in, which is really, really inconvenient. I tried processing my purchase multiple times during the day, but I kept getting unable to process order on this device error which was very frustrating. Fast and Secure and Popping !!!! Just downloaded the app and the app isn’t working. Im trying to buy tickets but it just keep saying it’s not working. Really needed these tickets by Saturday. The fees you charge per ticket plus per order is ridiculous. Especially for your average of accidentally canceling orders without notifying people or apologizing at all when a person has to hop through 30 minutes of hoops at a venue. Bad business practices with subpar apps is inexcusable but every event is in bed with this company so unavoidable. Excellent Service! TicketMaster Is The Way To Go! Just purchase VIP tickets for my daughter and us 2. Easy to purchase. But it does not navigate well...it is not clear to understand...it crashes... I miss the old Ticketmaster. Have your credit card ready and if you’re buying on the day of the show, don’t add parking. If you do, it will say you can’t do mobile tickets BUT it won’t let you choose will call either. I had to release the tickets and start over. The app is slow and the fees are ridiculous. That’s why Flash is my preferred choice for buying tickets...who still owns a printer? Bought my UM/Wisconsin 2018 football Tix with ease. Considering that Ticketmaster is such a big company, its app is SO frustrating to use. When I get music-lust, I like to see what concerts are on soon, but within 2 minutes of using the app I give up and leave it. The app needs better search and filter capabilities!!!! The app still crashes every time I open it in my iPhone X. All are updated versions including iOS. I only buy through Ticketmaster. They maker so easy compared to brokers. I’m going to all the MLB ballparks. The TM app makes it quick and easy to purchase a last minute ticket. I registered for ticket verified user for tickets for Hamilton at DPAC. I got my code and time to logon and code toner tickets. I waited all morning and when the tickets went live I entered the code I was given by Ticketmaster and it kept saying invalid code. I took off work to stay at home and get tickets and it was a total waste. Called to ask what happened and all they said was sorry. So upset and sad. I would give it five stars but I am having problems with this app purchased ticket and I don’t understand why it says voided When is shouldn’t be voided because I purchased it! I’m always having this problem! Why hasn’t it updated for August 17 the last update was August 14 and is telling me voided! I’m not purchasing new ticket! Seriously TicketMaster?! Get with the 21st century and implement Apple Pay! First time using the app today to purchase verified tickets. Used my access code to enter, select the tickets to unlock but access code does not work. After waiting for customer service I was told that it was a “user error”. Ticketmaster is the worst and needs to go away. Simple fast easy to use ! $112 worth of tickets winds up costing $143....userous! This app is unstable and has too many major issues. Just to name a couple, mobile tickets won’t show in the app. It always provides the error “cannot locate member ID.” Another issue is the favorites window is useless because it shows absolutely nothing. I love having all my information and purchases in one place. I love being able to get the best tickets and then getting notifications when my concert is coming up or that tickets are on sale. During ticket purchase the year date of show is not shown . Some confused, Nashville show to be in 2018. Ticket is for 2019 tour. The greatest for buying NFL tickets, fast easy and affordable compared to other parties!!!! This app looks and feels outdated. When I go to search an event, everything is fine. As soon as I tap on the event to see more details, instead of being taken to the screen that shows me those details, I’m met with a loading screen that loads ENDLESSLY. I’ve tried closing the app in the multitasker and reopening it, disconnecting from wifi, disabling mobile data, waiting at the screen, all to no avail. Unfortunately, I’m left with the conclusion that this is just a poorly constructed application with the bare minimum of maintenance to keep it up on the app store. The service fee is crazy, and then an order processing fee. And I am sure they still make money on the tickets. Always excellent service! The only way to buy tickets hands down!! The new way on purchasing tickets is awful . You can no longer pick your own seats. For someone who pays for the tickets should have a chose on where you would like to sit . You still can’t get good seats for a decent price bc the buggy app wouldn’t ever load tickets until 10 mins after the sale started and all the good ones were gone. Horrible. Save yourself the stress and just get a good seat for an exorbitant price. Easy to use app. Got my tickets fast and easy. When seats are “secured” prior to payment, the seats could still be sold and then your transaction will just not verify until you release the already sold tickets. I was done with my order when you timed me out and I lost the seats. I had to resubmit for seats farther back. I used the Ticketmaster app to purchase tickets for my wife and I to see Lindsey Buckingham in concert. It was a simple and convenient experience. The fact that you can’t pull up a list of all the tickets available for an NBA game and sort them accordingly is unbelievable. App makes no sense. I tried it on the website and was even worse. Crashed 12 times while trying to buy tickets (not exaggerating). Love using the Ticketmaster app makes buying a pleasure! Convenience charges & additional are an additional 33% of the ticket value. GFY Ticketmaster. It’s perfect! Everything you need and externally easy to use. Not sure why I wasn’t informed that there would be a $14 extra fee per ticket. Rather than give detail it was added on when I went to purchase. So I was aware that I would be paying an extra $28 before I charged my ticket, however I am sure that the method is without scruples. Is TM afraid that no one will buy a ticket online if the amount is disclosed appropriately or is it just lazy IT? I don’t know but I’ll try not to use TM next time. I want full disclosure. I was forced into downloading this app instead of using their website, and then charged $15 in service fees for 3 x $15 tickets! It’s convenient app, but I can’t put my tickets in apple wallet unless I’m on the desktop view. Trying to use the phone app & it kept spitting the order back at me, claiming I had put in the wrong security code on my card — I hadn’t. Third time it went through. $60 for one ticket and $15 IN FEES??? NO ALTERNATIVE if I want to see the show. THIEVERY!!! Thank you! We got our Hamilton tickets so quickly!! I had no issues with the website itself. I am super annoyed when you throw two different convenience fees which nearly doubled the price of a ticket. Why can you not just include it in the price of the ticket and then you can tax me. It is a little deceptive. Rates right down there with ticket master! All scams the tickets don’t exist or have been resold. It’s going to change your life !!! JUST GOOOOOO !!! I bought Colorado Rockies tickets and they would not link to the MLB Ballpark app as promised. If tickets and service fees are going to be exorbitantly high, it seems like customer service should meet the basic standard of delivering what is promised. Just like I explained in the title Bada Bing Bada Boom ! I purchased tickets to a game and protective insurance was offered (the box was already checked). I did not see the price of the insurance anywhere. When I clicked order details it still did not detail the price of the insurance. I clicked place order and I did not receive a confirm page for my total order, which I was hoping I would receive so I could see the price of the insurance. The next thing I know my purchase went through for the tickets plus a separate charge of $39.95 went through for the insurance. I had no idea it was that expensive. I felt tricked into purchasing really expensive insurance. This was a terrible experience. Expensive to get actual physical ticket! The app works fine, but Ticketmaster has succumbed to greed. I went to buy two $80 tickets the other day for Jay-Z and Bionce. That’s $160. They wanted to charge me $211. That’s like a 25% up charge. Ticketmaster is no longer respectable. Find other ways to get tickets. I've been a Ticketmaster customer for years. The fees keep going up and the service level continues to erode. Re-selling your tickets through their site is awful. If you are lucky enough to sell your tickets, Ticketmaster keeps your money for 5-7 business days. Why? In this day and age, there is no excuse for that. StubHub pays much faster and their customer service is so much better. The Ticketmaster app works about half the time. They make so much money on their tickets, they should invest some of their profits back into their customer service and technology. Simple, straightforward functionality. Specifying which show and sporting events I wanted to attend as well as my price range and preferred seat location was easy. I would like to see a photo view from EACH seat or section, not large groups of rows (I.e. 17-21). Overall, solid app. Toy get assigned a seat block. I purchased 4 tickets and my seat section was 1-7 so don't know if I'll get aisle or stuck inside. I love to use the app, it is an easier way to get my tickets! This app is very not functional for accessibility. I am totally blind and this app is insane. Nothing is labeled, images everywhere instead of descriptions of those images, screens that are totally not usable which appeared to be blank for me. The mobile app is not in sync with the website. I changed my password on the mobile app but when I try to login through a browser on my computer, it does not recognize my password and tells me password is invalid. I paid for concert thru ticketmaster and concert was postponed almost a year ago. And I have not receive my money back. I was all prepared to make a local donation but could not pay and receive my tickets on my phone, I would have had to also get my tickets in the mail or at will call. Sorry that I didn’t donate. Your website is trash, your app is trash, your fees are trash, and you are trash. Was so easy to find tickets, see prices and the view we will have! Much easier to use the iPhone then to try to use their computer software. What happened to PayPal option? What happened with having the option to pay with PayPal? Fees are a complete ripoff. They should be ashamed of themselves. My daughter and I were both searching for tickets using app over WiFi. Ticketmaster banned us even though we were legitimate customers. There is no way to get removed so the app doesn’t work. Fix this problem Ticketmaster!! Thanks for taking a knee NFL as I Pay $1200.00 to take my kids to the annual Thanksgiving game! Love this app was able to pick my ticket from a list or from the seat chart which I love the option. Quick fast and I’m ready to rock the house with Charlie Wilson. This app is terrible! 98% of the time you can’t get past the screen of how many tickets you want. The price range doesn’t come up majority of the time so it doesn’t allow you to click on ticket availability. If you try to skip that step it NEVER loads. Absolutely awful! I downloaded to app so I can download the mobile only tickets for Hamilton. After a 54 person online chat wait with Ticketmaster, I was told that the only way to get my tickets is through this smartphone. The web says my ATT mobile device is “invalid.” So, after logging in, the app does not find my events. It’s empty, even though I have the receipt, order number and tried to “text my tickets” 100 times on my computer. I am forced to get my tickets through my smartphone but it won’t populate my events w my login information. Then, on “contact us”, an email appears WITHOUT A “SEND” BUTTON. So here I am, trying to notify the creators of this app that is does not work and I can’t get my Hamilton tickets. This system of having tickets available for resale at higher prices is a wanton practice. I hate buying tickets this way and it is more frustrating. i’ve used ticketmaster before without a glitch, but i wanted to get shawn mendes tickets for the new tour and it won’t let me buy any platinum tickets and i’ve tried in different devices but it still says another fan got them which is a lie because the tickets have been available for weeks. i’ve tried calling and emailing and dming ticketmaster all week and no response. this company is ran horribly and has no regard for its customers. will be taking business elsewhere. Charge way too much for their service. It would be nice to have a little more time to purchase. It is a little stressful. Hola, ojala pudiesen tener traducción simultánea en español. I don't have any problems using this ap. I can pick my seat and pay my bill just as easily (for the Scottish Rite Auditorium). That's all I need. I used to detest Ticketmaster and all of my friends refused to use your service. Thanks for finally listening to what we have been saying. Much love and all the best! It’s so easy searching and buying tickets on the app. I love how it remembers my username and password. Ticketmaster fees are predatory and money grubbing. You offer absolutely no service besides being a middle man between myself and attendance at venues hosting incredible artists. Ticketmaster should devise a business model that properly distributes ticket funds to the artists responsible for attracting audiences while simultaneously respecting their consumer base, i.e the fans. There is absolutely no excuse for me having to pay the equivalent of an extra ticket in fees! The sooner you go out of business and/or your monopoly is broken up the better for Americans and music listeners around the world. I hope my mobile tickets work for this concert. Buying was easy and fast. Will see. I can’t get my head around the fact you spend less than $60 on 2 tickets and wind up paying $158. Back in the 80’s you would go to prison for that, now it is an accepted practice. What hurts even more is nowadays half the concert venues don’t even sell tickets to the average patron any more. You have to be some sort of clearing house to even get tickets. I remember the days when the Artists fought back against that stuff. Now it is just how business is done. I avoid Ticketmaster as much as possible. 20% - 33% of the ticket price is excessive. Approx 10 seconds after my first order was placed I started receiving tons of spam. My eBay account was hacked and a purchase was made using my saved cc on eBay. With Ticketmaster being as big as they are they should have a more secure system to protect their patrons which are mostly online. Super easy app with easy access to find your favorite concerts. We’re trying to give our Grandchildren a nice Treat, we get to the end of the purchase and the additional $7.99 fee is presented😱After paying for the tickets, then souvenirs and gas, that’s a car note. Purchased tickets and accidentally purchased insurance while scrolling down to purchase. Was not notified that extras were added to my purchase or my bill was going to go up. Can’t change personal info on app either or file a claim/dispute. Will use other apps in the future for ticketing. Added valet parking to my order, would not process but did not say valet parking not available. Had to start over 3 times. Very frustrating! 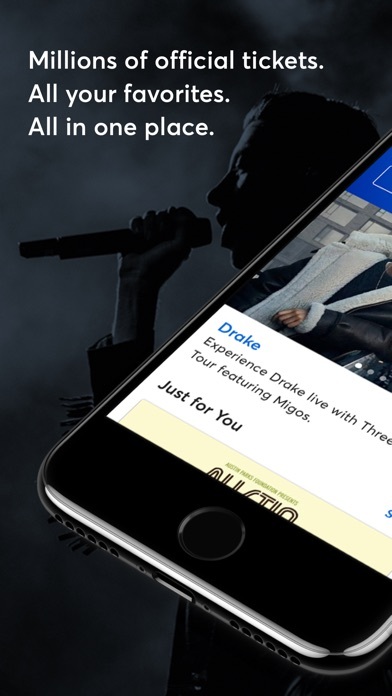 Ticketmaster makes it accessible to purchase tix. However, the fees are too high per ticket. Perhaps a small fee per order. I received an email saying If I bought tickets on or by 7/5 I would receive 10% off. It is 3 am on 7/5 and the code wouldn’t work. Very disappointing. Won’t let me sell tickets. I bought tickets to a braves game a few months ago hoping I could go. Ends up I am unable to attend. They will not let me print my tickets so that I can upload them to stubhub nor can I sell them on ticketmaster. With how this is set up, I essentially don’t even own the tickets. They just stole my money and I have no way of making up the loss. Worst ticket selling company ever. Will never use again. Ticket price practically doubled with ticket masters outrageous fees! I’m on the road to Asheville, NC. I’d like to see the MILB team in Asheville, the Tourists, while I’m there. The TM app will only show me games close to where I am now; or when I try to change location, it only recognizes Asheville as being in South Carolina? Hmmm... You win TM. I’ll find another way to get tix. Outstanding app. Quick and easy to purchase tickets. TM is the goto app for tix. They made my ticket purchase a lot easier. I would recommend people around it to buy tix from TM. Tried four times until I could finally purchase these tickets! 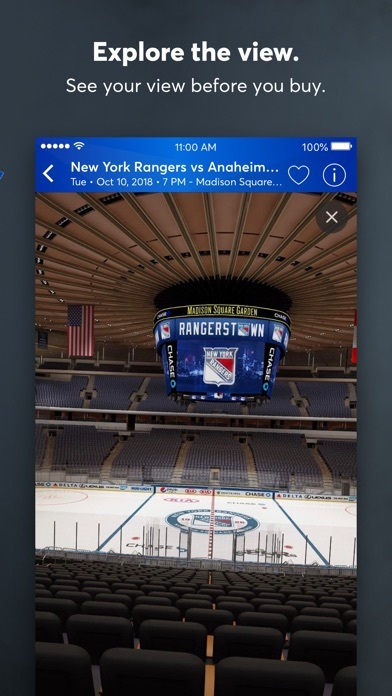 I love the easy way to purchase and the new feature to show the view from your seats just don't like the fees. Fees are way to high considering you not paying a person to help me. Otherwise I would give it a 5 star rating. Less of a review of the app and more about the money grabbing tactics of TM. I just bought two $35 tickets and TM added THIRTY-FIVE dollars of “fees”. For what?? I’m even taking electronic tickets!! Are they kidding??? The map is so small it’s hard to read, and it won’t enlarge. Also map is not interactive. 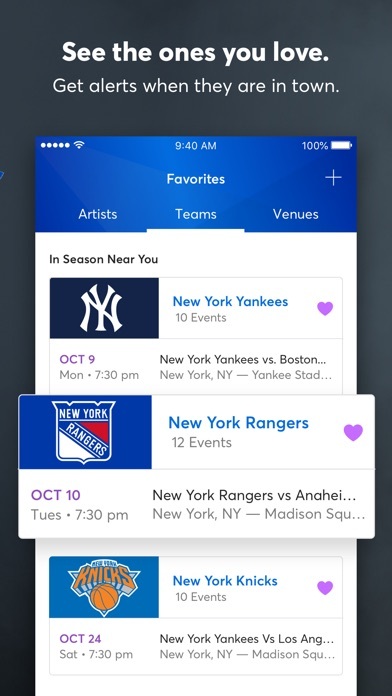 Check out SeatGeek, much easier to use. GO TO VIVIDSEATS OR GEEKSEATS! NEVER USING TICKETMASTER AGAIN. I ended up buying three tickets to a concert I wanted to in a different location because I figure when I type in “rob zombie at jiffy lube live” that my search results will be just that. NOT FOR NEW JERSEY. So if I call and I’m like “hey there was a mistake, I just want a refund so I can purchase the tickets I wanted at a location closer to me” I shouldn’t hear that I can’t get a refund because the tickets aren’t being refunded, I shouldn’t hear that I can’t exchange/transfer them and that my best option is for them to be resold, AND THEN NOT HAVE AN OPTION TO EVEN RESELL THEM ON THE SITE. Completely upset with the fact that the tickets being sold are non-refundable because the venue “isn’t refunding them at this time” If it was possible to rate this site with no stars and still able to write a review, Ticketmaster wouldn’t even be getting one star from me. There is not details of why 2 tickets that cost $29.95 each add up to $87..
A Must For Show Goers! Easy, quick and simple – I love the TM app. Highly recommend to everyone! I could honestly go broke with how easy this app. Is. I just got tickets for Marilyn Manson at House of Blues Myrtle Beach & then 5 minutes later got tickets for Godsmack. & Shinedown in Greens. NC. For an old fart like me this app is AWSOME!! Stupid!!! I wanna just look for an artist to go see! I don't know the zip code or the city!! That's what this app should be telling me so I can order tickets!!!! Quick and straightforward! Always buying tickets and it makes it so simple. What a convenient and quick way to get your tickets. Totally recommend! Do yourself a favor and get this app! Good to see you read reviews ticketmaster and fix things. We could not purchase the seats that we originally wanted because we wanted 2 of 3 seats left in a row and Ticketmaster will not let you break up those three seats. Stupid policy. The seats we have better be good, not much to choose from in blocks of 4 or more. There’s no business more hated in America than Ticketmaster. The fact that their app tries to hide the $17 fee I am paying on a $50 concert ticket is par for the course. Plus no way to print tickets anymore - I have to download their stupid app or pay $5 to ship. F you, Ticketmaster. You’re worse than Time Warner Cable. Congratulations. Literally tried to buy tickets the minute the box office opens and it’s already all resale? Sure seems suspect to me. The iPhone X app doesn’t function properly. When you click into an event, you aren’t able to view any info or tickets. Just a blank white screen. Ticket master is the worst because of their 15 dollar processing fee and the fact that bots buy all regularly priced tickets immediately and make every ticket more expensive. Wow I hate you guys. Thanks for making me spend more money on every show I attend! Ticketmaster blows. What a monopoly!! App works quickly & efficiently - takes minutes to secure seats. Bravo!! I tried in vain to buy tickets through Ticketmaster for an Eric Idle show in Boston for which I had a special advance sale promotion code from Brookline Booksellers. I logged on at precisely 12 noon and thought I had scored the best seats in the house! After the direct link allowed me to “purchase” seats, as I proceeded to checkout I was told the transaction could not be completed. This happened 5 times!!! Each time I was given a different reason why (which means there was no reason!). At one point the screen said use a different device (I was on my laptop for the initial tries). So I switched to my iPad and this Ticketmaster app - and went through the same failed process another 5 times. And I got a message that this wasn’t compatible with my device?! How on earth can an Apple app for Ticketmaster not be compatible with an Apple iPad?!!!! Then I tried calling their 800 number for customer service. I got a recording that they were busy & I should try again later. Then an automatic hang up! I tried another half dozen times and gave up. To add insult to injury, I got an email at the end of the day saying that if I was still interested there were tickets left. Just not any good seats that I was interested in! This app is a complete waste of time and I will NEVER buy tickets through Ticketmaster again! Brookline Booksellers should have been allowed to sell a block of their own tickets (it’s a reading from his memoirs after all) instead of being commandeered by Ticketmaster and the theater. Thoroughly disgusted with the whole process and lack of any service. Using the Ticketmaster app is so easy to use. I purchased my tickets in 2 minutes! I been trying to get here for a while and it finally happening, especially with the quickness of this app. It’s better than using a computer. Thank you TM! I was sent an offer by Ticketmaster to by Broncos tickets however when buy them today the app @ least 5 times told me that it had better tickets and sent me to those tickets ( didn’t have an option to say no) and then the app redirected me to no tickets available. Poor customer for Ticketmaster!! Little glitchy and slow but after some time I was able to buy the tickets I was after. I was given a Visa debit gift card. I wanted to use it for my purchase. However, even though it is valid, every time I try to enter the number under the gift card section it told me it was not valid. So then I put it in under a credit/debit card it excepted it but I needed to use it in conjunction with my credit card and wasn’t able to do it that. So I am pretty frustrated. That cancel button is everything!!!! It’s almost impossible to know which address is being used to ship my physical tickets too, which is an extremely horrible UX. Very bad app. Horrible interface. I bought tickets to the Harry Potter play - while I understand that that have to be strict with this show because the demand is so high, they refused to make any exceptions for me to change my ticket date EVEN THOUGH MY GRANDFATHER IS HOSPITALIZED AND DOESN’T HAVE MUCH LONGER TO LIVE. I’m sorry, how is anyone suppose to plan 14 days ahead for emergencies like this one? These are really liquid tickets (I have orchestra seats) and could’ve easily been resold. But instead, was just told by the box office that I would have to reach out to Ticketmaster, and told by Ticketmaster that they couldn’t do anything for me. Basically, rub salt on the wound - eat the cost of those tickets, too bad your family member is dying. I hate that this is the predominant service for purchasing tickets for shows. The fact that I have to by resale general admission ticked and $20 additional fees is crazy. They used to let you print out your tickets without having to pay an shipping and handling fee. Make the taxes cheaper please. I would just like to state how unsatisfied I am with the quality of your app. I’m out double the price of a ticket because your app can’t register whether or not I had scanned my ticket. Me and a few of my friends a couple weeks prior had bought a 4 pack of tickets but our plans had changed and I ended up coming in with my girlfriend (a separate time of entry as them) so a week before I had them send me my ticket through your app which we had purchased the tickets through (this means of sending was easily promoted and shown as an option) and when I arrived to the concert I was turned away as my ticket was already supposedly claimed despite me never entering the concert. If it weren’t for me having my debit card I’d have been out the whole night and either way I’m out an extra $45 because your app could not function properly. Very dissatisfied. $18 in fees and taxes is outrageous in this day and age where physical tickets are a thing of the past. Just bought 4 tickets at $20/ticket for monster jam. Total comes out to >$124. That’s 50% of ticket face value in fees. What a joke. TM has a great app. Easy to find the seats you want. It also gives me peace of mind, knowing I am getting guaranteed tickets. So easy to use app!! The process was pretty smooth, except we didn’t get actual seat numbers until well into the process. Considering the the ticket prices, this was a real risk. Also, the service charges were exorbitant. Ticket Master is pretty user friendly but not pocketbook friendly. Not just the app that is bad, Ticketmaster as a company does not try hard enough to avoid selling out shows in 20 seconds they also are know for selling tickets to other vendors prior to main sale in which those vendors crank up the price making it harder to tickets for cheap and harder to get tickets in general, hopefully they'll change or go out of business! Horrible app. Froze on me when purchasing tickets 3 times in a row and I had to pay an additional 20 dollars. I can’t believe the exorbitant fees that Ticketmaster can charge. Didn’t they get in trouble for this years ago with a class action lawsuit? How are they still charging such high fees? The app itself is reasonable but I feel taken advantage of every time I am forced to buy tickets from them. My friend and I first went to the TicketMaster app because our parents told us it could be trusted with our money. We both wanted to see the Twenty One Pilots concert together so as soon as the singles were dropped and the tour information was put out, we signed up for the Fam Ticket Opportunity. I understood this did not mean definite tickets. Sadly we were both waitlisted, which again, I understood. There was probably a high demand, some people could have beaten us. The regular sale for the tickets was July 20th, I knew this but kept checking the app ever since we were waitlisted. I checked every hour of the 20th. I woke up at 6 A.M. and somehow still managed to miss the sale despite checking frequently. The tickets are sold out in my area. And the seats that are left in the closest area are ridiculously expensive for the poor seating. My hopes have been crushed and I am left extremely disappointed. I was so proud to use my own money that I saved from my job to buy my ticket and I’m left with bitterness. I feel that the very least, I should have been sent a notification since I favorited the event on the app and signed up for the Fan Ticket Opportunity. I had selected four tickets I got one! Now I’m having to search for tickets for my family and none of us will be together! I hate TM. Their fees are ridiculous. Trying to buy a family four pack plus a child’s ticket for my wife and 3 kids to see Cirque du Soleil. $57 tickets become $74 each and they still try to get you to purchase another $7.40 in “ticket insurance.” The worst! They even added another star to the minimum one I tried to give it! I HATE TM! Great app and even better now with the etickets. It unfortunately seems like ticketmaster is the only way to buy original concert tickets online so they can do whatever they want. Yea you can buy tickets through the app (if it works) so it serves its purpose but its definitely not here for the fans. The app always locks up whenever anything important is going on like ticket releases and the fan ticket opportunity is a huge bust. I got told I was on the waiting list for a presale but an hour after it goes on presale theres already hundreds of tickets for resale for outrageous prices. I try to do the regular sale but of course it either locks up or only shows the resale tickets trying to mislead people. Anyways I probably wont get my tickets since tickemaster has a monopoly on original tickets and it allows so many resellers to scam the fans. This app screwed me and my father over at The twenty one pilots Banditø Tour presale. Tickets go on public sale today at 10:00 am local time. Anyone...don’t use the app! It will be stuck on the loading screen for hours on end and you will miss the tickets! To get tickets right away you need to be on the website before they go on sale AND need to be on a computer. I hope any other tøp fans get to get the tickets to our boys’ show!! ||-// Edit: I got tickets but through a resell source that costed me 300 bucks a piece! They use a stupid line system that puts you in a random place in “line” no matter how long you were waiting. Don’t waste your time...go to a third party like stubhub or live nation! It will cost you more but I got 5 pit tickets for 300 bucks each...when if I bought them at Ticketmaster I would’ve gotten crappy balcony seats! Very annoying. Many events requires printed tickets. So sad that $15 tickets cost additional $9 for your monopoly. I can’t buy them directly from monster jam I almost did not take my family because of your outrageous fees!!! I use Ticketmaster only out of pure necessity! Their fees are indefensible!